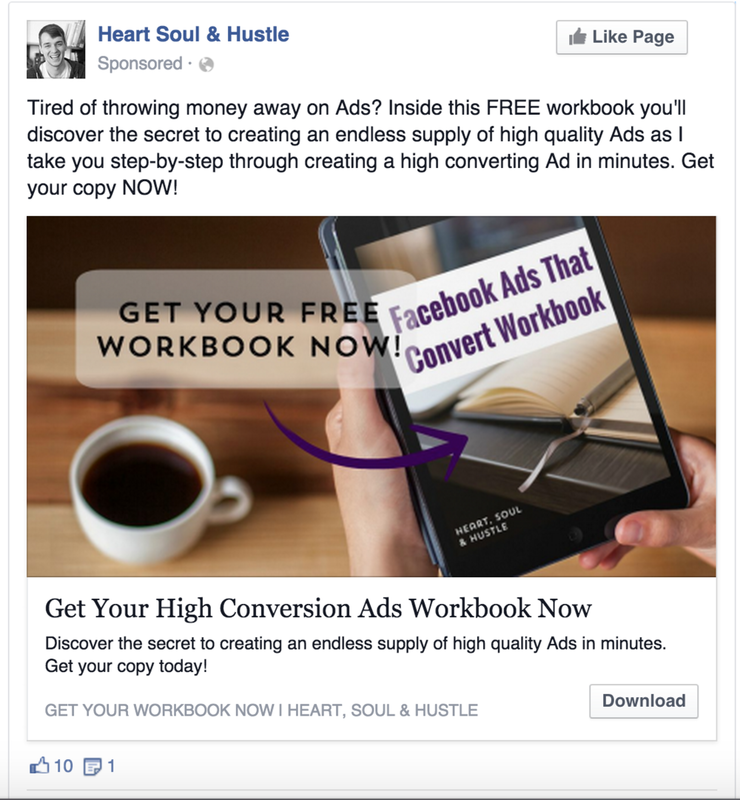 Today I want to talk to you a little bit about the anatomy of a high converting FB ad. Below you're going to find some stats as well as an image of the actual ad that I've run that has generated over 470 conversions at just over $530. This means I'm spending about $1.13 per conversion to rapidly grow my list. What you'll first notice is that I've used a very striking image with this ad. It's very simple, but it also catches your attention. It should starkly contrast with the Newsfeed, but it also has a direct call to action on it. The image is an incredibly important part of your ad. The image is arguably the most important part of the ad because it's generally what gets people to stop scrolling and start reading! Tired of throwing money away on Ads? Inside this FREE workbook you'll discover the secret to creating an endless supply of high quality ads. I take you step-by-step through creating a high converting Ad in minutes, so get your copy NOW! You'll notice that I've led with a strong question based on a pain point that my audience is experiencing. When you write your ad, you want to take some time to think about what is your ideal audience struggling with? For me, with this freebie that I'm giving away, they are struggling with creating Facebook Ads that convert. I take the time to actually say, "Are you tired of throwing away money on ads?" By doing this, I immediately allow my audience to qualify themselves to be eligible for this freebie. In the second part of the text, I go on to tell them exactly what they can expect inside the workbook. You want no surprises when people click through your ads. They should know exactly what they're going to get and how they're going to get it. I tell them, "It's free. It's a workbook, and it will take you through creating an ad step by step." I also like to throw in some nice juicy copy (like uncover, discover, or step-by-step) that tells them what they can anticipate getting when they get their freebie from me. Under the image, we have the headline for the actual link. I like to make sure this a strong call to action - very basic & very simple, but I like to say something like, "Get your (insert product name here) now." By putting another call to action in your ad, you're increasing the chances that people actually click and take action. For the link description I like to keep it nice and easy. You should really just recap what you put in the text in a different way. If you get too hung up on this piece, you're going to spend too much time on it. I've also found that most people aren't reading the text description, but if it's not there, it looks bland. Put in a simple text description. Don't stress over it too much. Just make sure it makes sense and it's in line with everything else in the ad. Then finally, make sure that you have a call to action button. You can use the download button, the learn more button, the sign up button. I personally like to use the download button. That tells people that on the next page, they should anticipate having to download something. The download button is not the highest converting call to action button (that would be the learn more button). However, by using the download button, you'll ultimately end up increasing conversions because you'll be telling people what they can anticipate on the next page. Remember this is all about increasing conversions, not necessarily increasing the clicks. Just because you get more clicks does not mean you will get more conversions. When you optimize all of these pieces, you end up with a high converting Facebook ad that not only generates you leads, but can also generate revenue and become incredibly successful product launches. Now get out there, create your high converting Facebook ad and if you haven't yet, make sure that you download your free Facebook Ads That Convert Workbook that can teach you how to create an endless supply of high quality ads step by step in the next 15 to 20 minutes.